Possibly the most beautiful map of Cook's travels in the Arctic. Le Coste Nord Ovest Dell' America e Nord Est Dell' Asia Delineate sulle ultime Osservazioni del Cp. Cook. 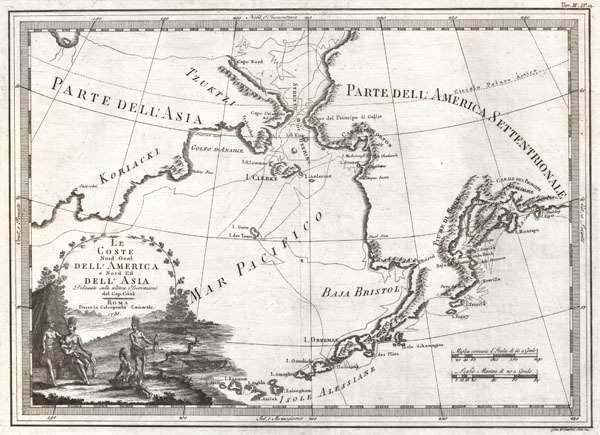 An extraordinarily fine example of Cassini's 1798 map of Alaska, the Bering Strait, and Siberia. Cassini issued this map in his 1798 atlas to illustrate the discoveries made by James Cook. Cook was the first to accurately chart the Alaskan coastline and provide a detailed mapping of the Aleutian Islands. Cook's zigzagging route is shown as he skirts the Aleutian Islands, passes through the Bering Strait into the Arctic Ocean, and then turns back to sail south along the Siberian Coast. Here the Aleutians are collectively identified as 'Isole Alessiane,' though many of the original islands are clearly given indigenous names. A large decorative cartouche in the lower left depicts four American Indians and a baby. This is perhaps the most beautiful of the many maps designed to illustrate Cook's voyages. As a side note the condition of this particular example is phenomenal, the best we've seen, if you are considering adding this extremely scarce map to your collection, this is the one you want. Cassini, Giovanni Maria, Nuovo Atlante Geografico Universale Delineato Sulle Ultime Osservazioni, V. 3, Rome: Calcogrfia camerale, 1798. An extremely fine example - the best we have seen. Original centerfold. Wide clean margins. Original pressmark visible. Blank on verso. Falk, M., Alaskan maps : a cartobibliography of Alaska to 1900, 1798-1, 1791-81, p. 72. University of Washington Libraries, Rare Map Collection. G9236 S12 1798 Z3.